Okay, so I probably should just face it: I’m not so good at remember to do these blog posts. It’s not that I don’t read, trust me, at least one new book a week if not more, but time seems to be eaten up by other things. Anyone else have that problem, where you try to find time to do something and it seems to always be interrupted by something else? Yeah, that seems to be life lately. lol. BUT I am going to strive harder (including reminders on calendar and such) to write posts more frequently than once a month. 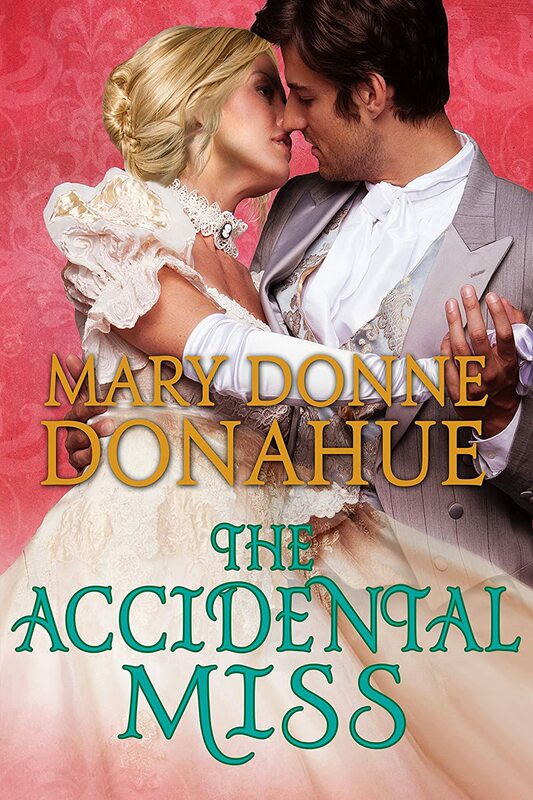 So, today I am, once again, sharing a new author with her first published work: The Accidental Miss by Mary Donne Donahue. I have to say, I was hooked with this story. I love regency, but this had just a little bit more that took it to that next level and made it completely unique. The setting is amazing, sure to delight any regency lover, and the characters are interesting, from the adorably sweet best friend to the absolute annoying ‘peacock’. Gwendolyn is such a unique character. She has such a good, joyful heart, but it’s tempered with her natural clumsiness. I love how she is so comfortable with who she is, how she is accepting, but that acceptance is challenged by society’s expectations. It’s nice to see a character who struggles with ignoring the world’s expectations, a character that’s understandable and relatable. And of course there’s Cameron, the quintessential charming English nobleman. He’s accepting of Gwendolyn the way she is, and becomes a bit of a knight in shining armor for her honor. The relationship between them is so refreshing to read, because while there’s romance it’s focused on their friendship and acceptance of each other. I love the supporting cast of characters, each a little gem of their own. The writing is so fluid even while it immerses you in the world of London, and balls, and carriage rides, along with some unforgettable and unexpected settings. The story is well-written, the journeys of both characters heart-warming. I am very much looking forward to future endeavors from this author. Interested? Pick it up for your Kindle (or Kindle app, like I use). It’s well worth the read!